Nothing frustrates me more than having to repack bags at the airport to avoid overweight charges. When you have to pay $50, $75, or even $100 additional each way, just one overweight bag can break a getaway weekend budget. Well that’s a thing of the past if you have a good luggage scale. Cue lights…pull back curtain…introducing the EatSmart Precision Voyager Luggage Scale. Ergonomically designed for even the slightest woman to use, yet tough enough to handle a 110# bag, this is the best scale I’ve had a chance to use. With a full D-ring style handle, it’s easy to lift and weigh even your toughest bags. The digital display is easy to read, shuts off automatically after 20 seconds and is powered by a long-life lithium battery. The unit only weighs 5.5 ounces, so you’ll surely want to pack it in your bag for the return trip. That’s when souvenirs, books and other accumulated “stuff” can make you overweight. Also, there has been a long standing limit of 40# for bags in the overhead bins. Don’t be surprised to start seeing enforcement of that soon as airlines keep looking for extra ways to make more fees. At home, I used to use a bathroom scale, which wasn’t convenient, but it worked. On the road however, most motels didn’t have scales, so I crossed my fingers a lot. Now I know for sure before I get to the airport. Priceless. 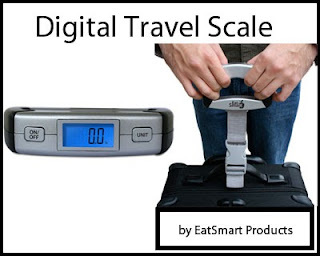 The EatSmart Precision Voyager Luggage Scale is available for sale online at their Amazon store. It comes with a two year warrantee.